Dina Gold is the author of Stolen Legacy: Nazi Theft and the Quest for Justice at Krausenstrasse 17/18, Berlin. She is a senior editor at Moment magazine, and worked as a reporter and producer for the BBC. Born in London, she now lives in Washington, D.C.
Q: You write that as a child you would hear stories from your grandmother about the building in Berlin your family had owned. What ultimately made you decide to search for that building? A: I really loved my grandmother Nellie Wolff. She would weave wonderful stories of her life in Berlin that were very tantalizing to a young girl. Nellie’s daughter, my mother, had also enjoyed a luxurious lifestyle up to the age of 11, when Hitler came to power and the family fled. My mother always discounted Nellie’s stories. 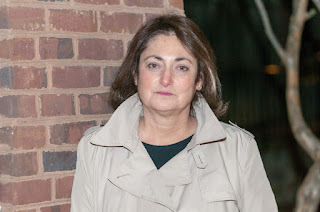 She said Nellie was a fantasist, her claims that the family had once owned a huge building were probably unfounded and that we should look to the future, not the past. I had a very different attitude. Yes, Nellie might have been mistaken but … it was also possible that perhaps she wasn’t. I absolutely had to find out! When the Berlin Wall fell in 1989, my parents were totally set against my starting a restitution claim. Nellie had died 12 years earlier, leaving no documents or photographs relating to the building, not even its address. My father would say, “You can't fight the German government, forget it.” The only person who supported me was my husband, Simon. Q: How did you feel when you started doing some research and realized your grandmother’s stories could be true? A: It was exciting and gratifying that my hunch seemed to be right. As I started to uncover more and more evidence it started to look as if Nellie had not been telling fairy stories. I determined that I couldn’t give up! I found the building in what had been the Soviet sector, just behind the Berlin Wall, two blocks from Checkpoint Charlie. It might sound like an exaggeration to say that I was driven by “the burden of history…” but actually it is not. He is, of course, absolutely right. Stolen Legacy is not directly about the genocide - which was unparalleled, unforgettable and totally unforgivable. 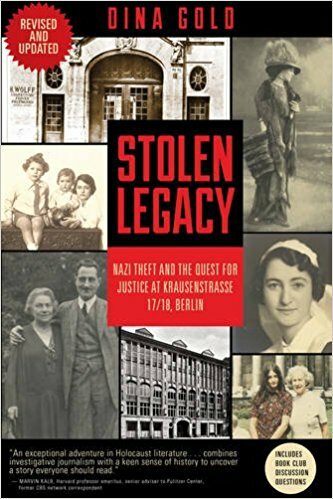 In a similar vein to that of the movie Woman in Gold, about the fight to reclaim a Klimt painting, Stolen Legacy is about the fight for restitution of a huge building in central Berlin. Q: How long did your effort take to obtain restitution? A: The case was concluded in January 1996. In round terms it took just over five years. Q: What are some of the things that surprised you as you learned more about your family? A: During my investigation to find enough evidence to present a legal claim, I discovered just how successful the international H. Wolff fur company had been. The family had tried desperately hard to hold onto the building, which had been the company headquarters. The paperwork I found revealed exactly what had happened, the process of the forced sale to the Reichsbahn (German railways), how the property had been used during the war and what the Communists did with the building when it was inside the territory of the German Democratic Republic (East Germany). 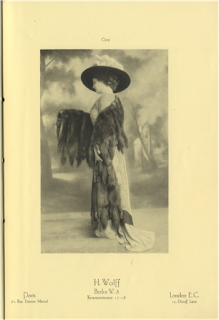 I visited the New York Public Library and discovered some old editions of a publication called “Fur Trade Review.” I looked at three years’ worth – from 1908-1910. This magazine is no longer published, but these issues offer a vivid portrayal of the once vibrant fur trade that flourished across North America in the early part of the last century. European dealers would visit the United States and establish business links here. 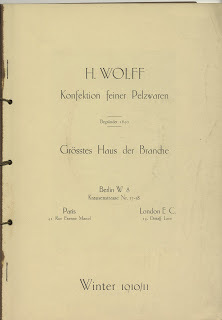 To my amazement I found many H. Wolff advertisements and photos of the company’s latest designs …not only coats but also stoles, muffs, hats and assorted accessories – all made from fur. It was yet further evidence of what a prestigious fashion house it had been. The librarians at the New York Public Library were perfectly happy for me to take photos. Q: In addition to the historical aspects of the story, this is a very personal book. How did you balance your roles as journalist and family member as you worked on the book? A: It’s interesting you ask that because a colleague who read the draft said to me, “I would have written the story with much more emotion.” But I am not like that. Being gushing and sentimental is not my style. I’m trained as a journalist and to a large extent I have to put my feelings to one side. I was haunted by the terrible discoveries I made while doing research into the fates of some of the people I wrote about. The U.S. 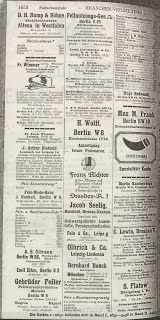 Holocaust Memorial Museum and the International Tracing Service (ITS), as well as many other archives I consulted, have a wealth of material for historians. 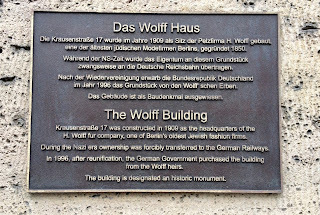 The Wolff family was comparatively fortunate. Not everyone in the family survived, but my grandparents, my mother and her two siblings did. I never forget that the theft of a building cannot be compared with losing family, friends and indeed entire communities. Q: At what point did you decide to write a book about your family’s experiences? A: I kept talking about it all through the claim. But I had a full-time job at the BBC, and three young children. Simon was working for the Financial Times and traveling extensively. I was too busy, and I just couldn’t do it. What prompted me was that, in 2008, I left the BBC and came to the USA on a green card because my husband had been offered a job in Washington, D.C. I brought all the case papers over. Simon said, “The children need to know their family history, so sit down and write,” and that is what I did. A friend who is a literary agent kept asking me to show her my draft. She really liked the story. And that is how the American Bar Association came to publish Stolen Legacy. Q: You've published an updated version of your book. What new material did you research and report for the paperback? 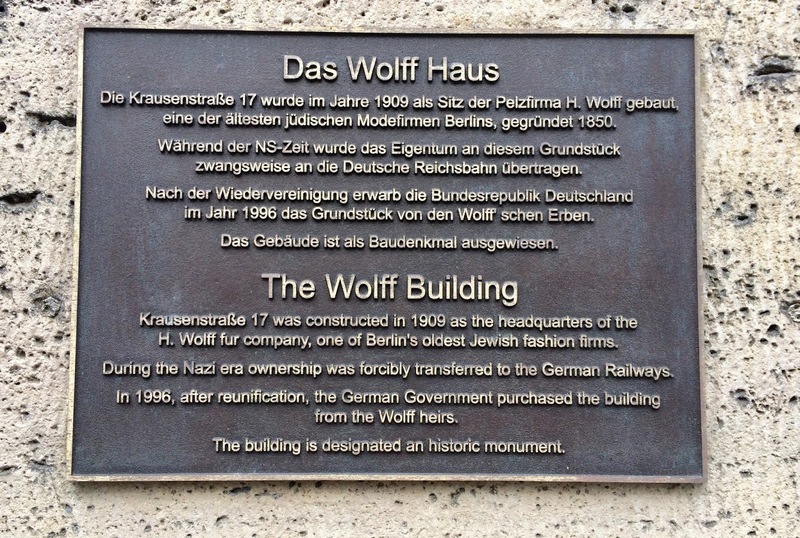 In the course of my research, I delved into the background of the Victoria Insurance company – and its Nazi-era chairman, Dr. Kurt Hamann – which had foreclosed on the Wolff family building in 1937 and handed it straight to the Reichsbahn. I discovered that the Victoria Insurance, under Hamann’s leadership, was part of a consortium insuring SS slave labor workshops at Auschwitz, Buchenwald and Stutthof concentration camps. I managed to obtain the actual policy documents. I also found out a lot more about Dr. Hamann’s career, his wartime role and how he was feted in the post war era. I already knew that the University of Mannheim, a very prestigious German university, has a stiftung (foundation) named after Dr. Hamann! Q: What has the impact of this new material been so far? I asked Professor Dr. Ernst-Ludwig von Thadden, President of Mannheim University, if he considers Dr. Hamann a suitable person to be honored in such a manner. I have been in correspondence with him for the past two and a half years about what should be done. The latest news is that a year ago, Prof. von Thadden told me that he had commissioned a renowned German historian, Prof. Johannes Baehr, to conduct an in-depth study into the life of Dr. Hamann. That report was initially due to be delivered by end August 2017. Prof. Baehr apparently found “more than anticipated” and suggested he would be in a position to “produce a first report before Christmas.” A decision would then be taken about the future of the Dr. Kurt-Hamann Foundation. A: When you last interviewed me, I told you how I had been trying to get a plaque placed on the building, explaining it was forcibly taken by the Nazis from its Jewish owners. In December 2013, on behalf of then Transport Minister Dr. Peter Ramsauer, an official e-mailed me: “I’ll arrange for the plaque to be produced and affixed to the office building.” But nothing happened. In Spring 2016 the BBC, my former employer, asked me to fly to Berlin to make a short film about the story for broadcast across the UK on International Holocaust Remembrance Day the following January 27. I flew to Berlin in May 2016 and was met at the building by officials only too eager to help! The knowledge that a BBC film crew was coming had seemingly galvanized them into action! And that’s how, in July 2016, I managed to have a plaque put at the entrance to the building. I have spoken in cities across the USA about the story of Stolen Legacy and everywhere I go I meet audience members who long to reclaim their own families’ stolen property all over Europe. It is a tragedy, and a scandal, that more than 70 years after the end of the war, thousands of people are still waiting for some measure of restitution. Next month I am off to speak at a conference in Munich. And finally … in the not too distant future there is going to be a Chinese language edition of Stolen Legacy published by the Sichuan People's Publishing House. I look forward to showing you a copy! --Interview with Deborah Kalb. Here's a previous version of this Q&A. Dina Gold will be speaking at the Temple Sinai Authors' Roundtable in Washington, D.C., on Feb. 24.